In the Office is a monthly series on YBC that shares insight on everything we have going on. Between the upcoming book, our YBC Mantra Boxes and retreats, there's a lot on the agenda, so it's nice to share an update so we're all on the same page. With all the awesome stuff we have going on between our book, the Mantra Box and more, we're looking for some ambassadors to help spread the word, review products, and more. We have big dreams for this ambassador program. Like every awesome thing, it'll start small with reviews and the like, and hopefully move on to something bigger (we'd eventually like to invite one ambassador to each retreat we do) and more. We want to grow our community, so we're looking for bloggers, social media influencers, yoga/Pilates studio owners, and more. If this sounds like something you might be interested in, hit us up here. We'll be in touch if you're picked! PS - Use the #YBCyogis hashtag on instagram for a chance to be featured in our weekend newsletter! The app is thriving with lots of new users each day! The YBC Official App is available for download, and if you have a second to leave a review, we will be happy to send you a little something in thanks if you screenshot your review to Lauren. The app is free to download and stream our videos from youtube, and there is an exclusive section available for $1.99/mo and you'll get a welcome video, a 20 minute video, and then every week you get new content. One video per month and three audio messages that can be anything from yoga tips to guided meditations. Do you need to have Facebook or twitter to sign up? Yes, that's the only way to be a part of the forum within the app. I just purchased the exclusive section but there is only one 20 minute video in there. Shouldn't there be more? There are more, but everyone gets the 20 minute video and then whatever we upload after that. They don't get access to the past videos that've been uploaded because that would be unfair to the people who have been a part of the exclusive section since day one. You guys, I love the yoga forum! There is so much good stuff going on over there and everyone is so welcoming, knowledgeable and helpful. There's also a chat room (just look at the navigation bar at the top of the page) and rumor has it it's a fun time in there! There's been some talk of a scheduled time to go in and chat so we'll test it out this weekend - and you're invited. Saturday, October 10, 2015 from 1 - 2pm eastern standard time. We'll chat about all sorts of stuff - I'll have some questions to start off with and then, like an awkward blind date, we'll see how it goes. (Ohh, that might be a good topic for discussion - who's been on a blind date?! Hahaha.) Anyway, join us! I used to really be into jewelry. My go-to going out outfit back in the day was a simple, plain tank, jeans, heels and big, chunky earrings or statement necklace. For my wedding, I kind of did the same thing. Simple dress and a handmade layered necklace. But over the years, I stopped wearing as much jewelry, and these days just stick with my watch and bracelet which never come off. I just don't like to feel like I have to baby my jewelry, you know? I like indestructible pieces. And also, now that I don't wear jewelry as often, when I do, I sort of feel self conscious. It's not a real problem, I know. Anyway, Rocksbox reached out and offered to send me three free boxes and I figured I'd try it out and report on how it went. It's a jewelry subscription box where, for $19/mo, they send you three pieces. You take a survey to let them know your style, add a bunch of items to your wish list, and a stylist will choose some from your list and send them your way. Once you get them, you have the option to either purchase them at a discounted price or wear for a few weeks and return whenever you want your next set. I wasn't crazy about any of the items sent my way, but have my fingers crossed I can get back into the jewelry game with the next box. If you're a jewelry-lovin' gal, you can use coupon code yogabycandacexoxo and get one month for free! 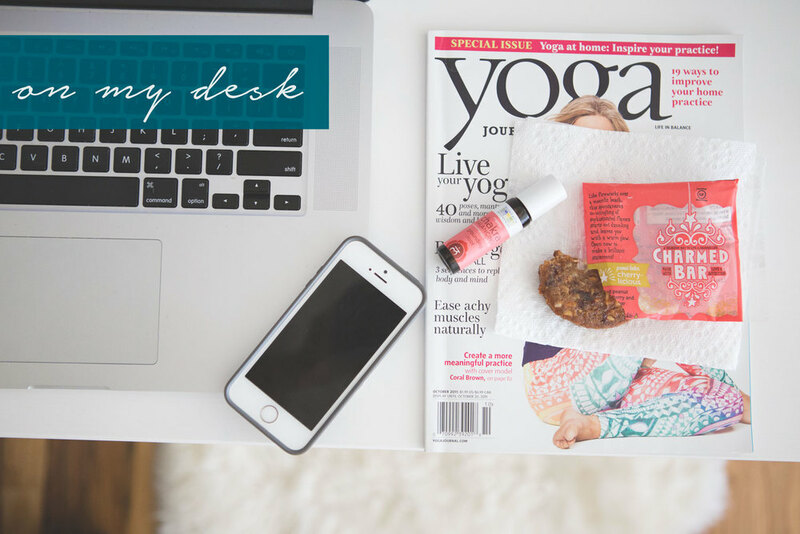 The latest Yoga Journal, and testing out some new goodies sent my way (#bestjobever) - a new bar (I met the owner at Expo East - she and her friend are behind making this awesome bar), and a grounding essential oil roll on. This one is very earthy, which I love, with patchouli, bergamot and nutmeg. This month we're in prep mode for all the fun things we have going on. The Book: I've just turned in the outline last week and am waiting to hear the feedback from the publisher. I've also looked into getting a trainer because I'd like to get in a bit better shape for the photoshoot which is in December. My focus will be to take care of myself as best as I can with all we have going on. I want to keep stress levels low, positivity high, and be sure to take care of myself so I can do my best. The Mantra Box: The Mantra Box, our awesome discovery box that highlights small business in the health and wellness industry, is almost sold out (grab yours now if you want to treat yo'self for the holidays)! All the contents will arrive to my office by the end of the month and we'll be putting them all together so we can ship out the first week of November. The Retreat: Our next retreat is in Costa Rica and it's coming right up at the beginning of November. Lauren and I will head down early to be sure everything is perfect for our students' arrival. We cannot wait! Looking forward to: Honestly, everything we have going on right now is just really exciting for me and I am looking forward to it all. And that's what we've got going on! Happy to answer any questions you may have! What's going on in your world? What do you do for work? How's your "office life" treating you? What's the best part of what you've got going on? What's the most challenging?